Does solar energy work in the Northwest? Absolutely! In fact, more and more people are opting to install solar systems every year in Washington and Oregon. Although many think of the Northwest (at least the maritime region) as gray and rainy, we actually receive 15% more sunlight annually than Germany, one of the world’s leading solar markets. A solar PV system generates electricity by converting sunlight into electricity that can be used in your home or business. This reduces the amount of electricity you need to purchase from your utility. If your system produces more electricity than you need at any given time, it will actually spin your meter backwards to supply the grid. Your utility keeps track of how much electricity you supply to the grid as well as how much you purchase, and bills you only for your net electricity consumption (via net metering.) At the end of any billing period, if overall electricity production exceeds consumption (indicated by a negative meter read) a billing credit is applied to your next bill. The size of a solar PV system is often described in watts (W) or kilowatts (kW). 1,000 W = 1 kW. Watts are a unit of power, just like the horsepower of an engine. They express the maximum possible output of energy the system can produce at any point in time. When sunlight strikes solar PV panels, they produce electricity that is measured in kilowatt hours (kWh). Kilowatt hours are the units of energy you buy from your utility and use in your home to run your appliances, lighting and electronics. What kinds of incentives are available? Washington and Oregon both offer a variety of incentives to help you with your solar purchase. 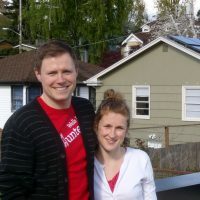 Additionally, Solarize Northwest offers their own incentives to give you an even better deal. For more information, check out our incentives page. Will installing solar affect the resale value of my home? A Lawrence Berkeley National Laboratory study found that California homes with solar commanded a market premium roughly equal to the cost of the system, decreasing somewhat as the system ages. The study has recently expanded to add a smaller number of home sales in other states and has found similar results. Although it’s difficult to generalize these results to a specific market and home, the evidence is strong that solar systems hold their value upon resale.